Is oil a renewable resource? 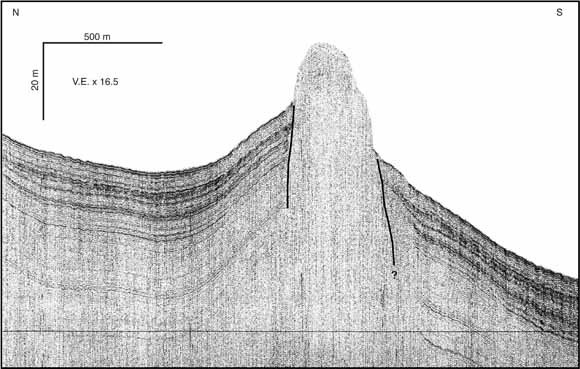 Seismic image of a mud diapir. Notice how the mud has pushed through layers above it. Since the discovery of the Chapopte asphalt volcanoes, other asphalt volcanoes have been discovered, and while actual samples have not been collected, it sure looks like there is an asphalt volcano on Mars! Possible asphalt volcanism on Mars. 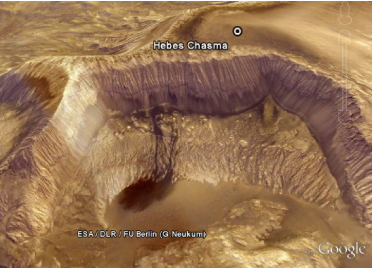 If you have Google Earth on your computer, select "Mars", then "fly to" Hebes Chasma, and you can see it. Heat from the magma chamber generates warm water, which rises. Cold water rushes in through cracks in the sediments to replace this water. In the process, it reacts with hot rocks, forming petroleum products. It also turns into a supercritical fluid, which causes the sea salts to precipitate out (turn to solid). NOAA image of Lost City, where researchers found clues about serpentinization. One conclusion from the graph above is that most of the crude oil in Brazil, and everywhere else (including Mars!) was formed by serpentinization that is still going on today. Oil is not a “fossil fuel”. It was probably not formed by dead dinosaurs, flamingoes, and algae dying and slowly decomposing on the ocean floor over millions of years. And even if dead plants and animals were the source, they would have to be buried rapidly, all over the world, since oil is found all over the world. Think about what this means. If we can develop drilling techniques that can handle even more high temperature, high pressure (HTHP) situations than they do right now, we just may find more oil and gas than we could ever use! Also, notice that in the reaction shown above, carbon dioxide (CO2) is a reactant, which means that for those who believe excess carbon dioxide is heating the earth, all you need to do is find a way to pump it down to one of these undersea heat engines, and carbon dioxide will be consumed (sequestered). Researchers are already trying to figure out how to do this. And while we are on the subject of greenhouse gases, did you know that water is a much worse greenhouse gas than carbon dioxide? Think about that while you are thinking about how oil and gas may not be as “evil” as some people try to make them seem. We should be VERY glad that the formation of oil-trapping piercement structures has slowed down today from a more rapid rate in the past. The tectonic activity (earthquakes) involved as lower density salts, gases, and oils pushed through sediments all over the world must have been tremendous. I would speculate that most of this was formed rapidly during the global cataclysm described in Genesis, and most of the piercement structures moved upward during this time, before sediments had a chance to do much compacting and lithifying (turning to rock). Most of these heat engines have cooled considerably, but they do still carry out the process of serpentinization, and with the right tools, it is something we could manipulate. If there is really a whole lot more oil and gas than we are led to believe by major media outlets and many government leaders, this also means that gasoline prices should drop once we learn how to get to more of this oil. It also means that America’s current desires to make ethanol from corn could be a waste of time. If you are a person who thinks we should halt all oil drilling to “save the planet”, I encourage you to think again. Think instead about encouraging better and safer technology to extract oil and gas from deeper, hotter sections of salt domes in places like the Gulf of Mexico. We don’t need to “save the planet”, we need to manage the planet wisely, and we all need to think harder about how to do that. Science in Texas public schools would take a shocking leap backward if the State Board of Education approves newly proposed instructional materials that promote creationism and reject established, mainstream science on evolution, spokespeople for the Texas Freedom Network (TFN) and the National Center for Science Education (NCSE) said today. In addition, public schools using those creationism-based materials could face expensive legal challenges even as they struggle with massive budget cuts at state and local levels. A biblical, Christian worldview does not promote the dumbing down of science, it promotes the advancement of it. There is no conflict between a person’s faith in God’s word and their ability to understand the 1st Law of Thermodynamics, supercritical fluids, proteomes, etc. A proper reading and application of Scripture actually promotes science. Groups like NCSE and TFN promote bigotry and creationist hysteria when they say people with creationist beliefs are “anti-science,” and that a curriculum that dares to make the connection that things that look like they were designed might indeed have a Designer could “dumb down” Texas science education. The idea of intelligent causes is taught in the curriculum created by International Databases, LLC. As this International Business Times article describes, the curriculum uses a “null hypothesis” that intelligence was behind the origin of life. In other words, the null hypothesis is that things that look designed were in fact, designed. The alternative hypothesis is that things that look designed were in fact, not designed! Now honestly, how reasonable is that? Well, it is not reasonable at all, and the null-hypothesis is about as close as you can get to a self-evident truth. Something else to consider about the supplementary curriculum proposed by International Databases is that when they talk about “intelligence,” they are not necessarily talking about the God of the Bible, but as author Stephen Sample says in the International Business Times article, the intelligence could be aliens. And some biology textbooks have already included chapters about aliens. Mainstream scientists have repeatedly shown that those arguments [about intelligent design] lack scientific merit. Moreover, in 2005 a federal judge in Pennsylvania ruled in Kitzmiller v. Dover that teaching intelligent design in public schools unconstitutionally promotes creationism. Actually, what mainstream scientists have shown us is that there are limits to genetic change. An honest evolutionist will tell you that evolution theory cannot predict future results, which makes it the most un-scientific theory currently in existence. I cannot think of any other theories that claim to be scientific but have zero ability to predict future trends. Regarding the TFN press release statement on Kitzmiller v. Dover, this is correct. The trial concluded that teaching creationism is unconstitutional. The trial did not show that evolution was scientific and creation/intelligent design was not. The PBS program NOVA made a documentary of the trial titled Judgement Day: Intelligent Design on Trial. Although the documentary was biased towards evolutionism, they did a fairly good job of showing both sides, acting out the trial using direct quotes from individuals involved. Watch the documentary, and at about 1:17 to 1:22, you can see how the scientific case for evolution did not win out over intelligent design, so the plaintiffs switched to the “religious argument”. So, the Dover v. Kitzmiller case declares creationism is unconstitutional, and a violation of the First Amendment, where the American government is to “make no law respecting the establishment of religion.” But what is creationism? Ultimately, it is an idea used to explain origins. But wait, that’s what evolution is as well! Evolution is an idea used by some to explain how God brought about life. People who believe this are called theistic evolutionists. Others who simply “believe” evolution explains life’s origins are also being religious, because there is no way to prove evolution, so to believe it and promote it at the exclusion of other ideas about origins is a faith-based, but bigoted, way to think. So, while TFN and NCSE promote creationism hysteria and warn about impending lawsuits, what might well happen is that they will be on the losing end of any legal battles they initiate. Dover v. Kitzmiller could be overturned. Proclaiming that people who believe God created are “anti-science” is unreasonable. Saying evolutionary explanations about origins are “scientific” is also unreasonable, because answering questions about origins is outside the limits of science. The Texas Freedom Network and NCSE are not about the advancement of science and math education, but they are about promoting creationism hysteria. Whether you are a creationist or not, please think carefully about the fact that what these two groups promote will actually damage science education instead of advance it. When groups like TFN and NCSE tell someone they are being “anti-science” because they believe that a thing that looks designed might in fact, have a designer, they are discouraging students from diving deeper into math and science. I wonder what would happen to Texas’ math and science teacher shortage if groups like TFN and NCSE actually encouraged people who believe in a Designer instead of discouraging them by labeling them “anti-science”? Since polls consistently reveal that most people believe in an Intelligent Designer, I would say TFN’s and NCSE’s current mantra discourages a lot of rational people from pursuing math and science careers. If the skimmer’s fish-catching techniques are not impressive enough, consider that it also does this at night! That is why its upper surface is black, to camouflage it for night-fishing. Also, notice when its bill is open, the only color a fish that is in front of it would see is black. It would not see the orange-red section. What an incredible design! Give up? They are in the top right corner of the photo. If you are not impressed by the incredible design of the Black Skimmer, then I’m afraid nothing will impress you! In His goodness, God made this bird incredibly special and unique. Some bird groups, a.k.a. “baramins”, like warblers, have more diversity since the Genesis Flood, but not skimmers. Three “species” (maybe not really species?) exist worldwide. Skimmers catch dinner by skimming their enlarged lower mandible through shallow water, somehow avoiding all underwater obstacles (I’ve never seen a skimmer “crash!”), and they even do it on the blackest of nights! 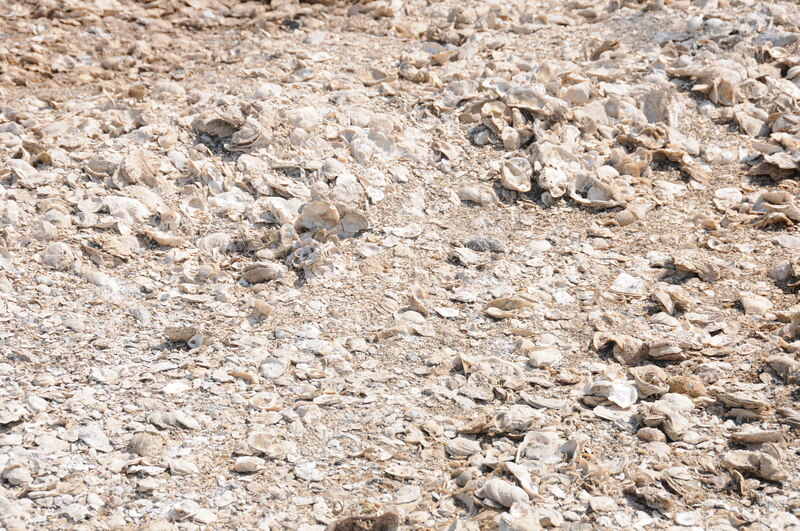 They lay well-camouflaged eggs, and the parents, who mate for life, take turn incubating the eggs and raising the young. Awesome! Click here for a coloring page of the Black Skimmer. Remember, the Black Skimmer is black on top, so use the thin line that is beneath the eye as your border between the black and white.